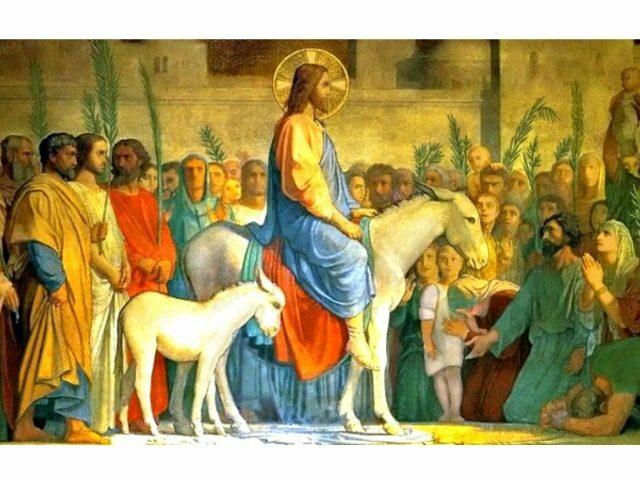 So is it Palm Sunday or Passion Sunday? Which Gospel do we meditate on this week? Well, the answer is “both.” If you follow the tradition, you do the Palm Sunday reading with the procession of palms, and then the passion reading during the Gospel. This week we’ll be drawing from both Gospels, which provides for a lot to meditate on, given the two chapters involved in the passion reading. Today, given the greater purpose of this daily project – combating neo-Gnosticism in the world today – we’ll contemplate the difference between orthodoxy and Gnosticism as it pertains to Christ’s death. Keep in mind the foundational difference between Gnosticism and orthodoxy. Gnosticism sees the creation as essentially evil, created by an evil god. God did not create us in the flesh. Rather, we fell into the flesh. The evil is not that we as created beings broke off from God; the evil is that we exist. Therefore the evils of this world – the sin, the death, the warfare, famine, diseases, struggles – are unredeemable. By contrast in orthodoxy, we believe that God the Father made all things in heaven and on earth, visible and invisible. The physical world is a manifestation of His very Being, the product of His Word, and all the various, multiple physical things and beings are like His lexicon. And Adam, the one in His image, was mustered into service of this creation, to name it and have dominion over it, being its steward. The evil of this world is everything that the created order is not. The Tree of the Knowledge of Good and Evil promised knowledge of something beyond the totality of what God has created, which was “very good.” Adam’s temptation was whether he’d be content with this totality or whether he’d choose to find out what this “evil” was all about. Well, if curiosity killed the cat, so did curiosity – or better, his desires – bring Adam, his progeny, and the whole creation back to dust. That’s the work of sin. Given which foundation you begin with, you have what the Savior saves. Given the Gnostic foundation, Jesus came to save the fallen spirits from the entrapment in the material world. There’s no point in making sense of the evils of this world, the sufferings, death, wars, famines, and struggles. There’s no redemption; it’s just a matter of rescuing the fallen spirit from this mess. In orthodoxy this is not the case. No, the creation is the Lord’s work, and as Jesus repeated in the Gospel of John, His work was not finished, and Jesus had to finish His work. It’s a work of redemption. Because Jesus fills all things, He is the foundation for a new creation (even as He was the foundation for the first creation). He is the life source for new life. For this week, we consider what this means for us. Because He fills all things, even the depths of our suffering, sorrow, sin,, and death, we know that behind these elements of our lives – for we all suffer, have sorrow, sin, and die – Jesus is working redemption. He is present with us in these moments, ready to grab us by the hand and lift us up with Him into His exalted status at God’s right hand. So the question is this, did Jesus come to help us escape our suffering, or to redeem it? The answer should be obvious now. Jesus didn’t bid us to leave our cross behind and follow Him up and out. He bade us to take up our cross and follow Him. For this reason the martyrs are often depicted with their means of struggle, their means of death. Their suffering becomes part of their identity. Why? Because through them, the Lord brings them to their exaltation. The same is true with us. Very often our sins, our struggles, our diseases, become wrapped up into our identity. Gnosticism says, “You have to either escape these or just indulge them because they don’t matter.” Orthodoxy says as St. Paul says, quoting the Lord, “My strength is made perfect in weakness.” That’s the true glory and mystery of the cross in our lives.